Ever leave home without your cell phone? For most of us, the answer these days is no. I think I’d be more comfortable leaving home without my pants on. I feel more naked with no cell phone. The cell phone has become our portal to the world and we pretty much have one with us at all times. They come in a variety of shapes and sizes. Whether in a boat, on a plane, traveling through Africa, taking a road trip, or backpacking the Rockies, our cell phone has become a regular piece of Every Day Carry (EDC). I think it’s pretty safe to say that we will probably have our cell phone with us if ever faced with a tragic survival situation. It’s also not hard to imagine that it might not be working. 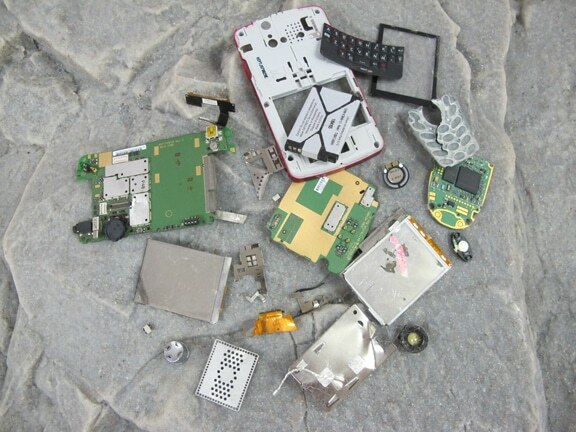 Regardless of the reason, a broken or busted cell phone is STILL an amazing collection of pieces and parts that, with a little insight and creativity, can be used to help meet a surprising number of basic survival needs. How do I know this? I busted open a handful of cell phones to find out. Each of the cell phones I cracked open had metallic, mirror-like layers of material behind the screens. 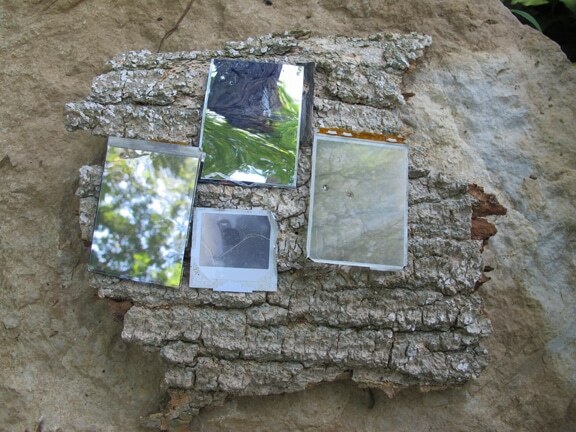 These can function as a perfect survival signal mirror. The reflection from a mirror can be seen for miles by land, air, or water rescue crews. This has saved the lives of many survivors in history. You can even use the reflection from a bright moon to make a flash at night. 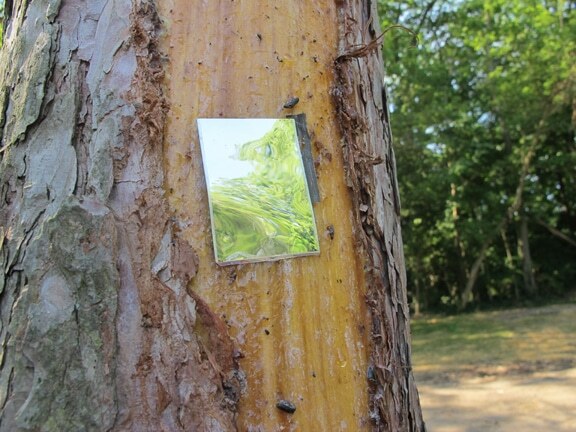 I made a more workable signal mirror by “gluing” the reflective pieces to a hunk of bark with some pine sap. Aiming an improvised signal mirror requires a little finesse. 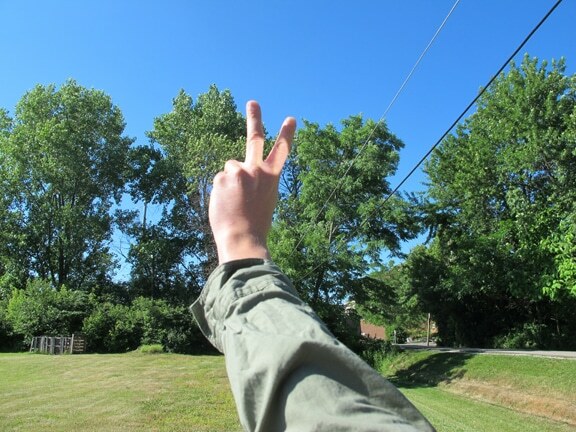 Simply hold up your peace sign and place your target (the rescue crew) in-between your fingers. 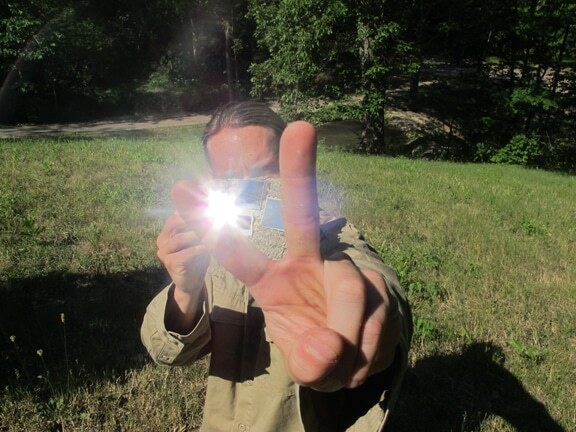 Then, flash the sun’s reflection across your fingers. 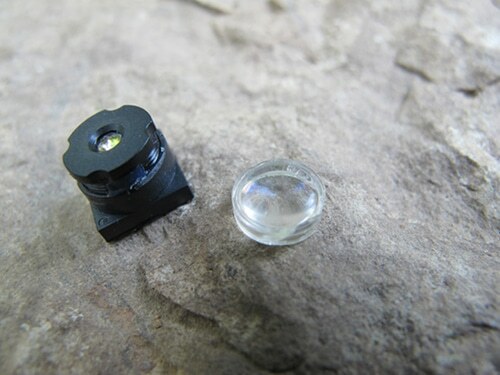 You can see the reflection on your fingers which ensures you are also flashing your target. Most speakers (if not all of them) contain a magnet. All of the cell phones I opened contained a magnet with the speaker portion of the phone. All of the phones also contained MANY little pieces of wire that I could magnetize; it must be a ferrous metal wire – copper will not work. 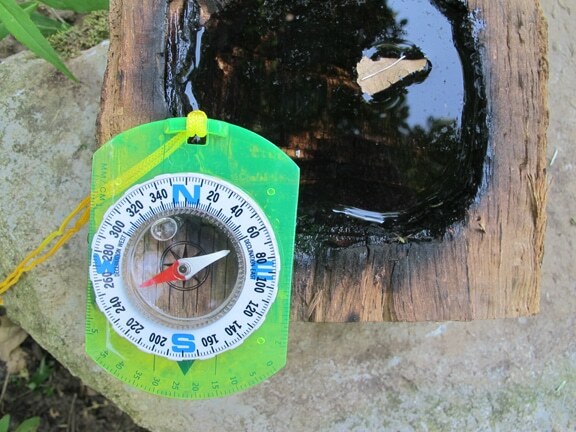 With these two items you can make a very accurate improvised compass. Sweep the magnet across the metal wire in the SAME direction 10 or so times. Make a mental note of the direction you are sweeping the magnet. This is the end of the wire that will point NORTH. You can then FLOAT this metal wire in a small pool of water on a small leaf or shaving of wood. It must be a completely undisturbed pool of water with no current so as to not affect the results. The wire will align itself with the NORTH-SOUTH line with the end you noted above pointing north (in the Northern Hemisphere). Right of North is East and Left of North is West. Now you know direction. Each cell phone also had a circuit board. 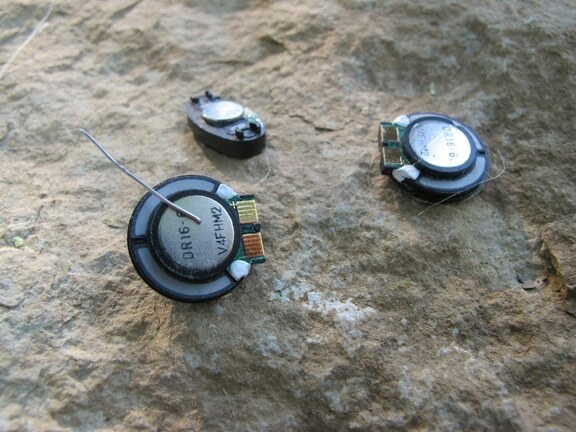 I used the circuit board from a SmartPhone to make two very useful items to a survivor. I noticed that when I abraded the edge of the circuit board against a smooth rock it actually ground down to a fairly decent cutting edge. 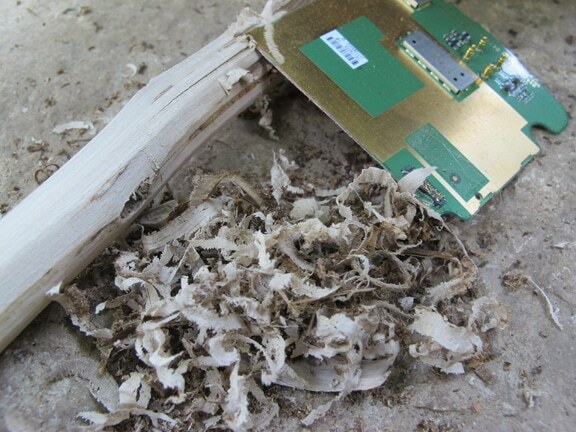 I used half of the circuit board to make a useful cutting tool which I used to gather and cut some natural bark cordage and also scrape a pile of very fine fire tinder shavings from a dried Mullein stalk. Both of these items are incredibly useful to a survivor. 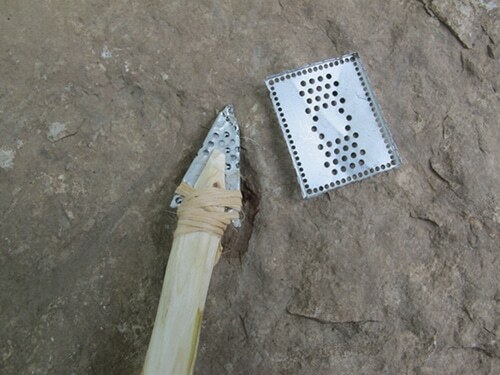 This crude cutting tool can be used for a variety of other survival chores as well. 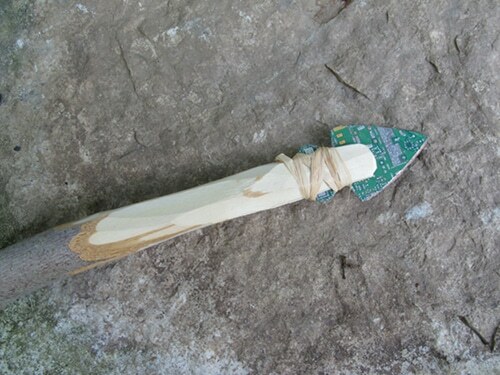 I then shaped the other half of the circuit board into an “arrowhead” spear point which I lashed onto the end of a willow shaft using the natural cordage I gathered. I abraded the edges of this point against the stone to sharpen it. I’ve made many make-shift gigs and spears in my life, and I have no doubt that this point can do some serious damage – either in self-defense or in food procurement. 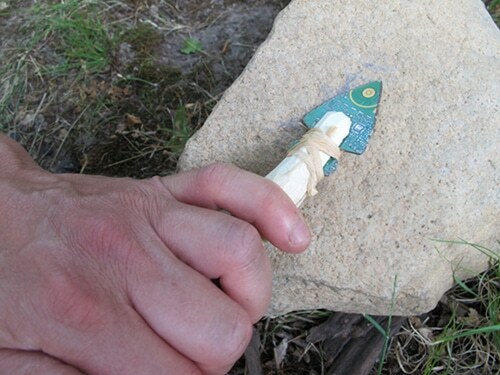 I was also able to make a back-up gig by folding and pounding (using two rocks) a small, thin piece of metal into another arrowhead-shaped point. This is crazy sharp and is very similar to a make-shift broad head. 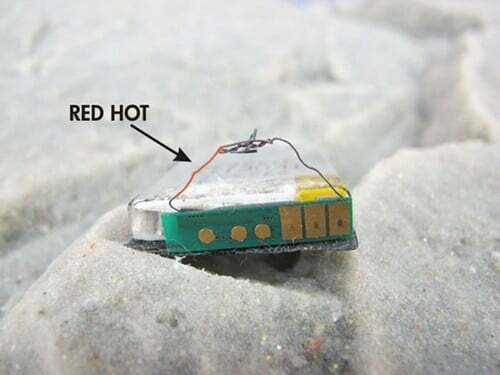 Probably the most valuable piece of a broken cell phone to a survivor is the battery. 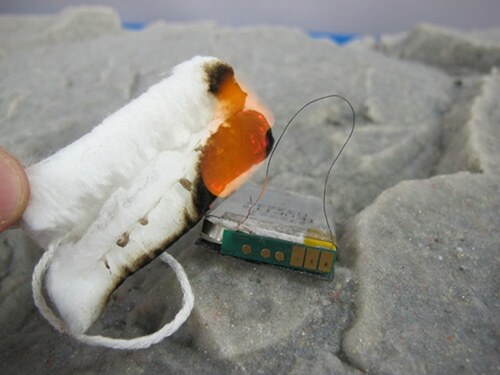 Almost any battery can be short-circuited to generate either a spark or a hot enough wire to ignite flammable tinder. Fire can be used in a survival situation to signal for help, boil water, regulate core body temperature, make tools, fend off predators, and cook food. Everyone has seen the old steel wool trick. 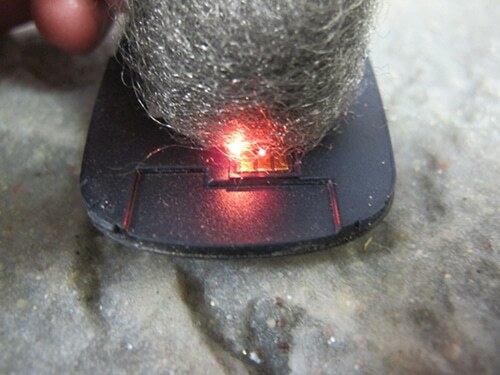 Steel wool ignites very quickly when brushed across the positive and negative terminals on a cell phone battery. But, when’s the last time you saw a wild steel wool tree? I seriously doubt you are going to have some steel wool on-hand in a survival situation. 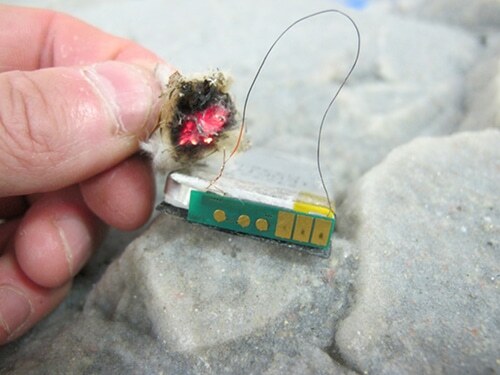 However, I used thin wire that I found inside a cell phone to connect (and short circuit) the cell phone battery. It almost instantly turned red hot when I touch it simultaneously to the + and – terminals. I had to peel off the battery’s outer coating to do this. Make sure you have your fire tinder ready because it doesn’t last long and is almost certainly a one shot chance. 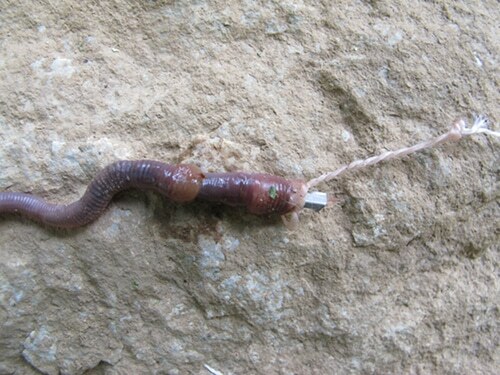 This red hot wire can be used to ignite natural found tinder such as the below seed pod or a spare SURVIVAL TAMPON. As I looked at the pile of cell phone parts in front of me, some looked surprisingly similar to fish tackle lures, so I went to work and quickly created these four fishing lures. The most basic lure is the one marked GORGE. This is a classic survival fishing hook and rather than hooking a fish, it “gorges” itself in the fish’s throat. It must be baited in parallel with the fish line as shown below. 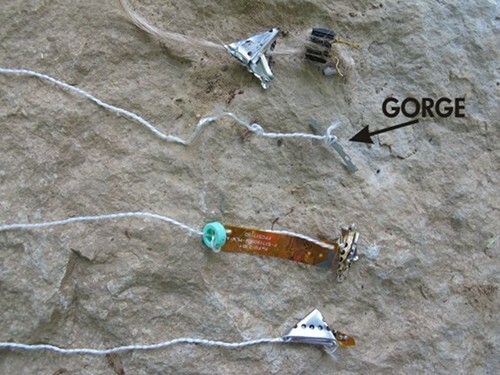 Once the fish swallows the bait and the line is pulled taught, the gorge pivots on the line and “gorges” in the throat. I counted as many as 20 gorge lures in one phone. 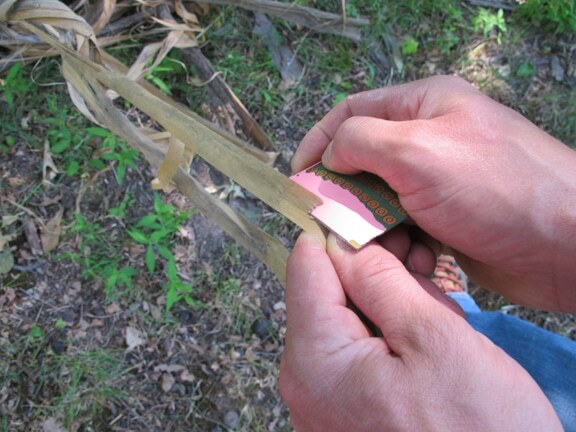 With enough cordage you could set out several fishing lines to work for you. Do you use wired headphones with your phone? If so, this use might come in handy. 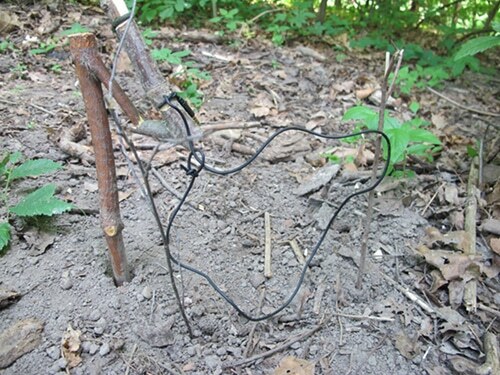 A small game survival snare can be made using the wire from a pair of headphones. This wire can also be used for a variety of other projects that might require cordage. Setting snares allows you to focus on other survival priorities while they hunt for you. To see exactly how to make this snare, read this survival snarearticle. 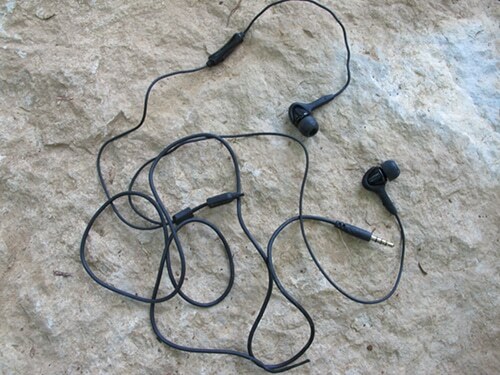 Instead of the headphones silently playing your music, let them silently hunt for you. It goes without saying that your cell phone should only be dismantled as an absolute last resort option in a survival scenario. Even when there seems to be no signal, your phone might be able to register a ping from nearby cell phone towers which can be used by first responders to track your general location. 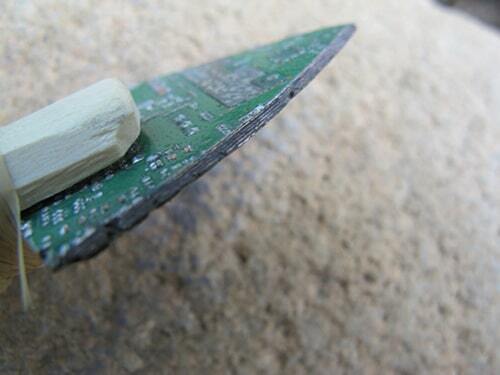 But, if it’s already busted, one of these tricks just might save your life. 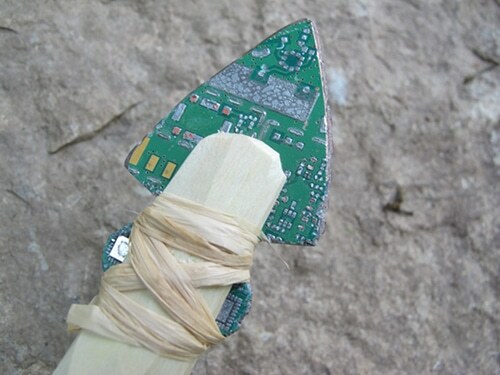 What other survival uses can you think of for a busted cell phone? This entry was posted in Preparedness 101 and tagged fire, fishing, knife, navagation, signaling, snare by paadmin.Bookmark the permalink.